Apptimi provides your business with a forms builder, reporting tools, input and editing forms and access management. Our form builder lets you create, edit and share any data from text fields, numbers, contacts, documents and photos. 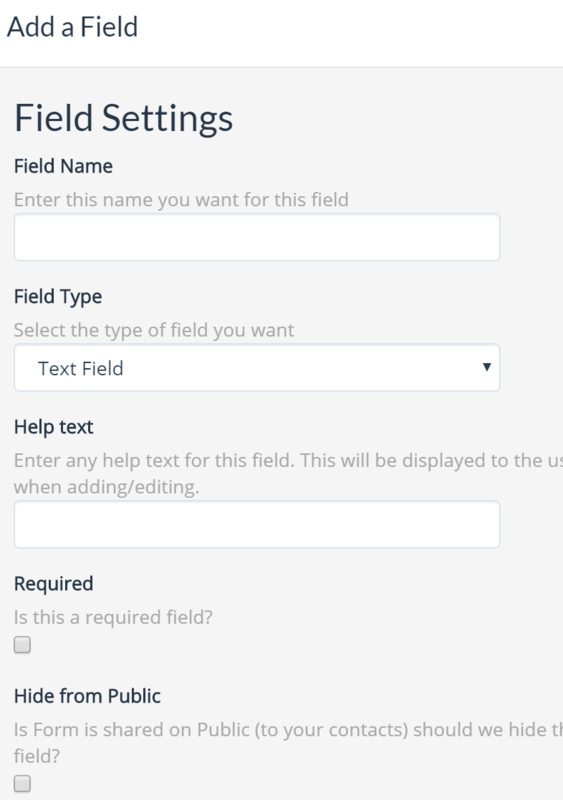 Our form builder lets you create forms simply - no writing any code, just choose your field type,give it a name, width, help text and save. 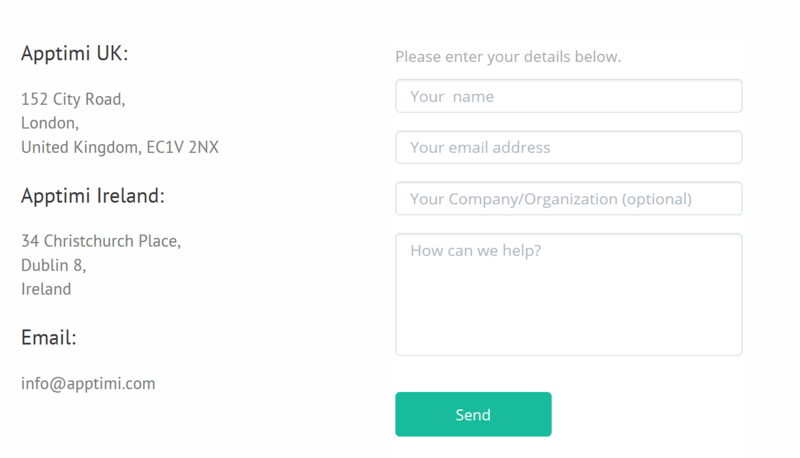 When the form is complete you just add it to any Shared Inbox or your customer portal and start sharing with your team or customers. Link to Contacts, Staff members and auto calculate fields using our easy to use rule builder. Unlike many simpler forms builders , we support many field types so you can select the right one for your form - From dates, time, select lists (single and multiple choice), check boxes, document and photos, text (single and multi line) and lots more. 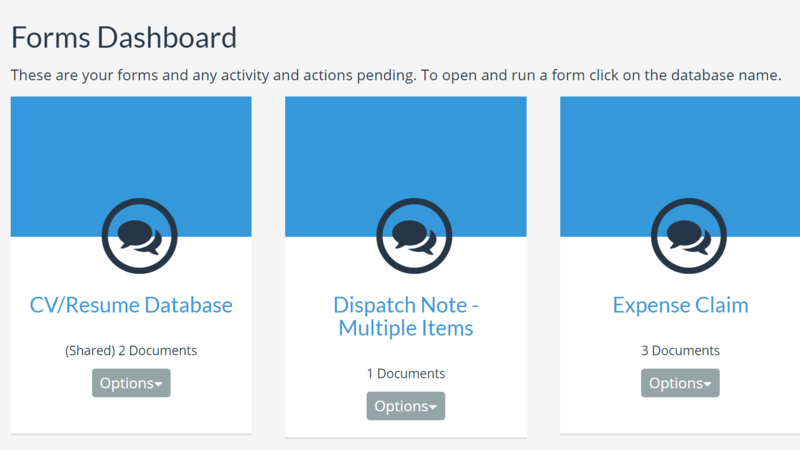 We've taken our forms builder to another level - You can add multiple grids or tables to any form. Great for adding detailed items to a form such as individual receipts for an expense item or product orders. Grids are available on all forms , even for contacts filling in your form externally. If you share a form with a customer or contact, we will automatically add the contact details to the contact manager. Every form saved by a customer or contact will build your contact list so that you can communicate back to the contact - You can reply to any form saved by a contact and get clarification or updates. 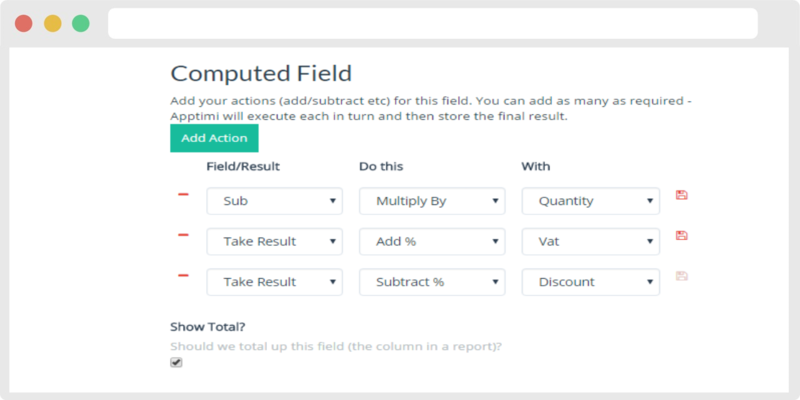 Create computed fields Apptimi will automatically do the calculations for you. No limit on the number of rules you can add to a field. Contact/Customer/Vendor Most forms center around contacts - customers, suppliers or members. Apptimi lets you link forms with individual contacts so that you can easily manage customer data/ With a form field you can build add or use contacts directly from the form. Contact fields can be used for membership lists, as a CRM to link activity to a contact or for tracking product deliveries to a contact. Any form can link to any contact in our contact manager. When importing into Apptimi we will match an email address with contacts in your contact manager and substitute their contact details in place of the email address. Staff Selector Select a staff member from list. Can be used for tracking forms or for work flow and routing for approval. Apptimi can route forms documents to staff members for approvals or notifications - Great for expense claims, travel requests and other approval forms. Date Fields Set reminder dates (like renewal or contract anniversary dates and Apptimi will set a reminder that date (or in advance). Reminders will also display in your team calendar - Great for follow-up, expiration and other date fields. Grid/Table Build a grid on the form and add unlimited dynamic rows. A Grid or table allows you to embed another form view in your form. The table is comprised of columns or fields (any of the fields listed on this page) grouped in a single row. Lists Within Apptimi you can create lists, each consisting of multiple items. An example is a product list with an entry for each product. You then add a List field to your form, choose the Product list and when the form is run the user will select which product. This provides a powerful form that can integrate with your business processes. Number Fields Selectable format and range. Apptimi can calculate totals and averages in your reports for number fields. Select Lists/Dropdown Create user selectable lists. Multiple choice option also available.